How history's only five-star admirals triumphed in World War II and made the United States the world's dominant sea power. 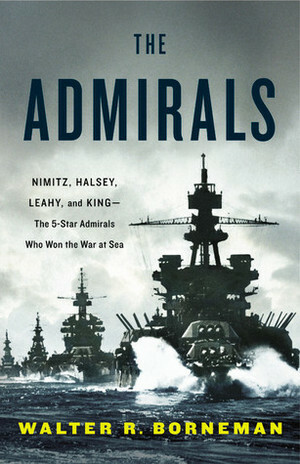 Only four men in American history have been promoted to the five-star rank of Admiral of the Fleet: William Leahy, Ernest King, Chester Nimitz, and William Halsey. These four men were the best and the brightest the navy produced, and together they led the U.S. navy to victory in World War II, establishing the United States as the world's greatest fleet. In THE ADMIRALS, award-winning historian Walter R. Borneman tells their story in full detail for the first time. Drawing upon journals, ship logs, and other primary sources, he brings an incredible historical moment to life, showing us how the four admirals revolutionized naval warfare forever with submarines and aircraft carriers, and how these men-who were both friends and rivals-worked together to ensure that the Axis fleets lay destroyed on the ocean floor at the end of World War II.